First of all I hope the double S and apostrophe is correct grammatically. Second of all you all probably know that minimum wage went up in a number pf provinces, including Alberta, lately. Wrong decision that I don't know if enough thinking had been behind that or not but it originally led to more than 80,000 job losses in the country! I've never been a business owner but I've watched every business I've worked for or dealt with closely. There's lots of waste and unnecessary work as a lack of organization, system and competent management. However that is a different subject that I will probably post about it later but I wanted to briefly refer to the reaction of one major international business, or to be specific, a certain location to wage hike and I hope I'm right. Typical McDonald's customer. This guy has either consumed so much narcotics that can not keep himself up or has been up all night looking around and hunting(!) 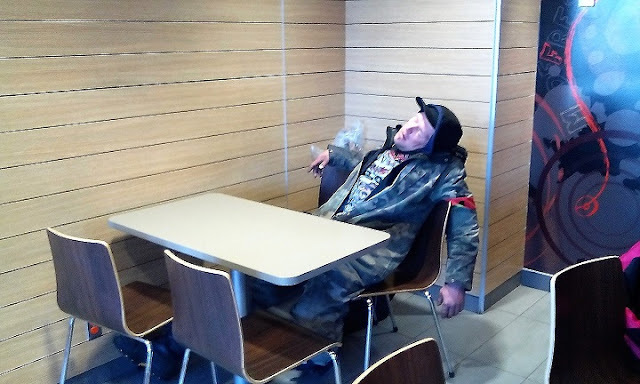 and now where's better than McDonald's to relax? There's this McDonald's that I used to go to a lot and I don't any more, as part of my money-saving plan and although that location being nasty and full of drug addicts, hobo and troubled people. I was there once about a week ago or so and I wanted to sit and work on my studies. My computer was low on battery and I wanted to charge it. I realize that all of the outlets are blocked! I don't know how much electricity a computer charges if it is plugged in for its battery but compare to what McDonald's wastes on daily basis, it's nothing. And I know that every branch is managed individually but they all must follow certain standards dictated by their head office. For that reason I'm going to find out if McDonald's Canada authorizes that or not.